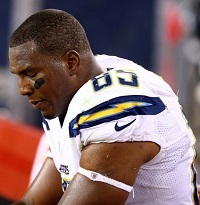 After a wild 2015 many have wondered if San Diego Chargers tight end Antonio Gates would retire. Gates will be 36 at the start of the 2016 season and is coming off of a year where he was suspended for four games and fought through injuries. All of that would make anyone his age seriously consider their retirement. Michael Gehlken of the San Diego Union-Tribune reports that Gates may not be ready to retire just yet. He’s spent all 13 years of his NFL career in San Diego. It would be a major upset if there isn’t a 14th. Gates did perform quite well when he was on the field, even when he was banged up. With that being the case he knows he can still produce so it looks like that won’t be a factor. The question then would be is the drive still there? The Chargers went 4-12 last season and didn’t look like a contender at all. Would he really want to come back to play for a losing team? He actually answered that question after the teams finale on January 3rd. He said how much this team fights and how proud he was about it. So basically the way Gates has been talking, Gehlken is right, all indications point towards Antonio not being ready to retire. It doesn’t mean that it won’t happen but it does seem very unlikely. The question is will the Chargers pay to bring one of the best tight ends in history back? Personally, I’d think they’d be fools not too.